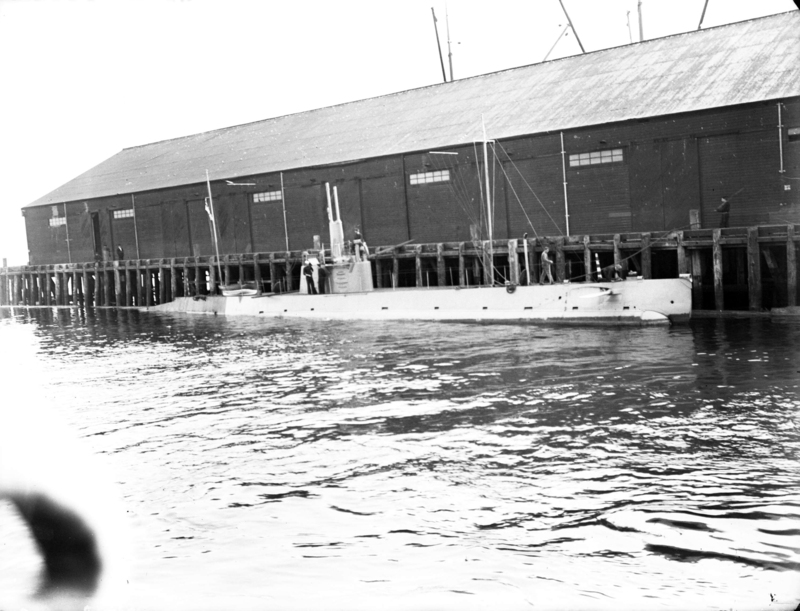 H-4 Class Submarine:Built by the British Pacific Construction and Engineering Company, Vancouver, Canada for Imperial Russian Government; Acquired by US Navy 20 May 1918; Reassembled at Puget Sound Navy Yard, Bremerton, WA. ; Laid down, 25 May 1918; Launched, 14 November 1918; Commissioned, USS H-8, 18 November 1918; Redesignated USS H-8 (SS-151), 17 July 1920; Decommissioned, 17 November 1922, at Norfolk, VA.; Laid up in the Reserve Fleet; Struck from the Naval Register, 26 February 1931; Final Disposition, sold for scrapping, 28 November 1933. Specifications: Displacement, Surfaced: 358 t., Submerged: 467 t..; Length 150' 4" ; Beam 15' 10"; Draft 15' 10"; Speed, surfaced 14 kts, submerged 10.5 kts; Depth Limit 200'; Complement 2 Officers, 23 Enlisted; Armament, four 18" torpedo tubes, 8 torpedoes; Propulsion, diesel electric, New London Ship and Engine Co., diesel engines, 960 hp, Fuel Capacity, 11,800 gal. ; Electro Dynamic Co., electric motors, 600 hp, Battery Cells, 120, single propeller. 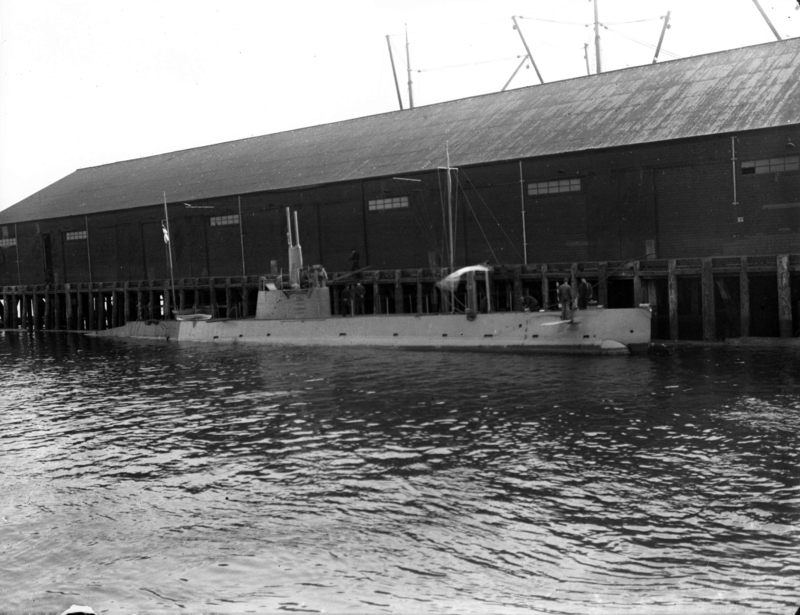 30k H-8 (SS-151) under construction at Puget Sound Navy Yard, Bremerton, WA. 1918. USN photo courtesy of Ric Hedman. 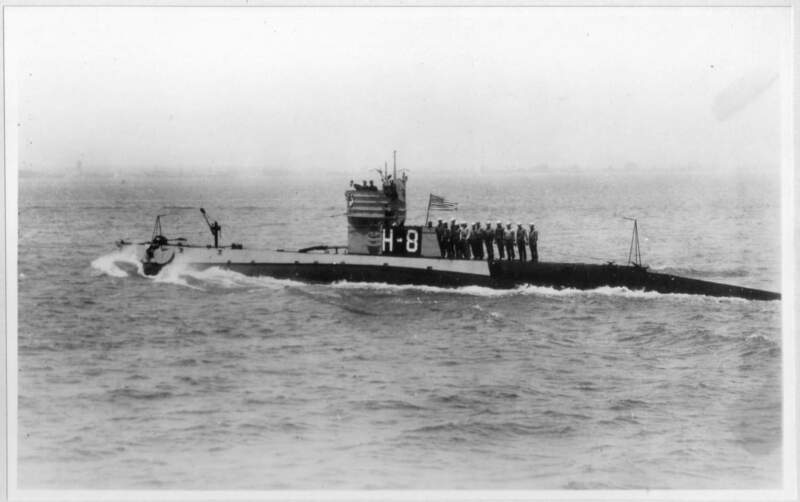 401k H-8 (SS-151) as U-98. 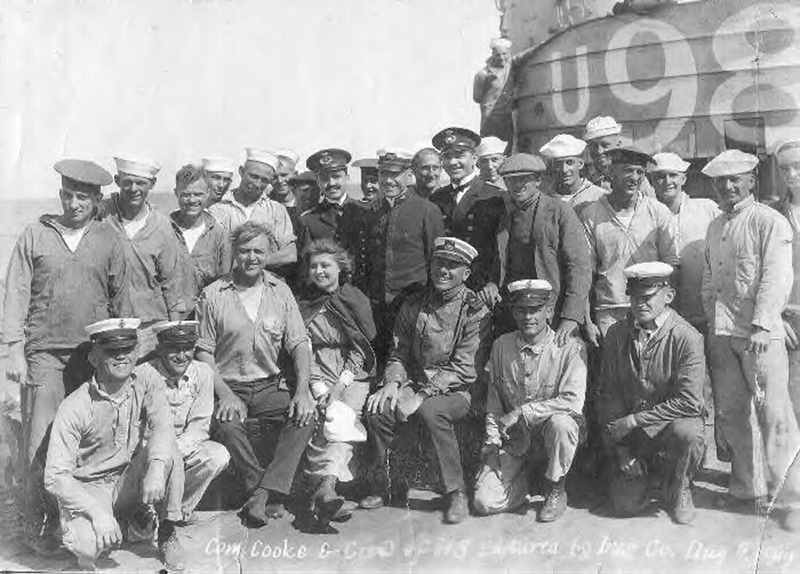 This photo taken on 9 August 1919 shows a mixed group of H-8 crew and movie actors including Wallace Beery, (right center, second row), Jane Novak and Hobart Bosworth, (left center, second row), with the real Captain of the boat, Lt. Cooke is in his normal uniform (center front) as is CRM Harold Lintner, kneeling, 1st man, bottom row at left side of photo. A number of the crew are dressed as German sailors and worked as extras in the movie. This silent movie was called "Behind the Door". Text via Ric Hedman. 86k H-8 (SS-151) on maneuvers, off San Pedro, 1918, where she was attached first to SubDivs 6 and 7. Operating with her sister ships, H-8 engaged in extensive battle and training exercises out of San Pedro, varying this routine with patrols off Santa Catalina Island. Note the ship's offficers in the conning tower and the crew on deck. USN photo # 19-N-20293, from (NARA), courtesy of Daniel Dunham. 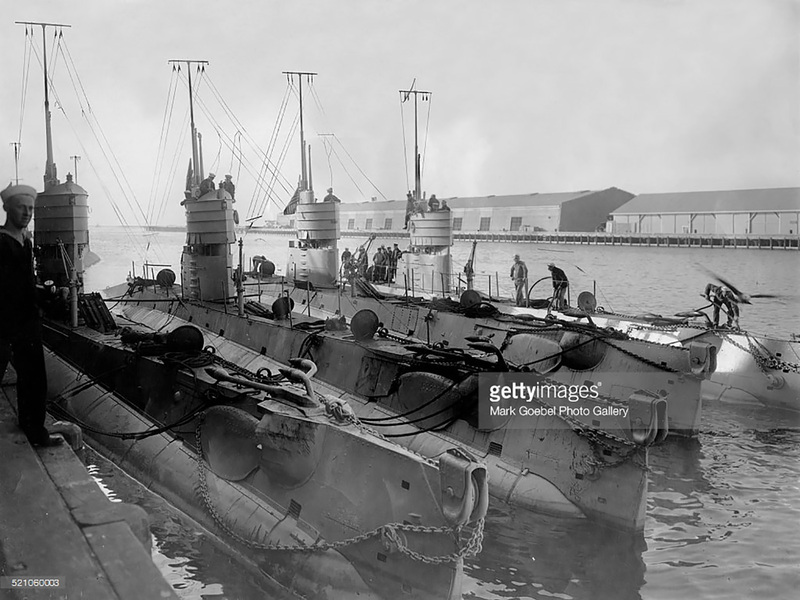 410k Four unknown H-boats at San Pedro, California, late 1910s. Photo i.d. courtesy of Ric Hedman. Photo by Mark Jay Goebel/Getty Images, courtesy of gettyimages.com. 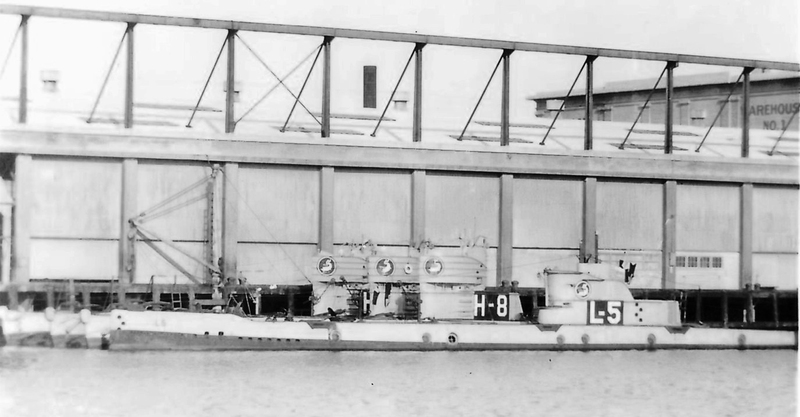 483k L-5 (SS-44), H-8 (SS-151) & 2 unknown H-boats between 1919 & 1922. USN photo courtesy of David Buell. 2.84k Two views of an unidentified H boat at Johnson Wharf. Photo i.d. courtesy of Ric Hedman. Photos # CVA 260-80 & 260-94 courtesy of James Crookall via searcharchives.vancouver.ca courtesy of John Hummel, USN (Retired). NR Starting a 5,000-mile journey, which will end at their own graveyard,twelve H and L type submarines left the Navy base at San Pedro, CA, recently, bound for Hampton Roads, VA. through the Panama Canal. Upon arrival on the East coast they are to be decommissioned and cut up for scrap iron. Photo from The Weekly Iberian. (New Iberia, La.) 1894-1946, 19 August 1922, Image 2, courtesy of chroniclingamerica.loc.gov.